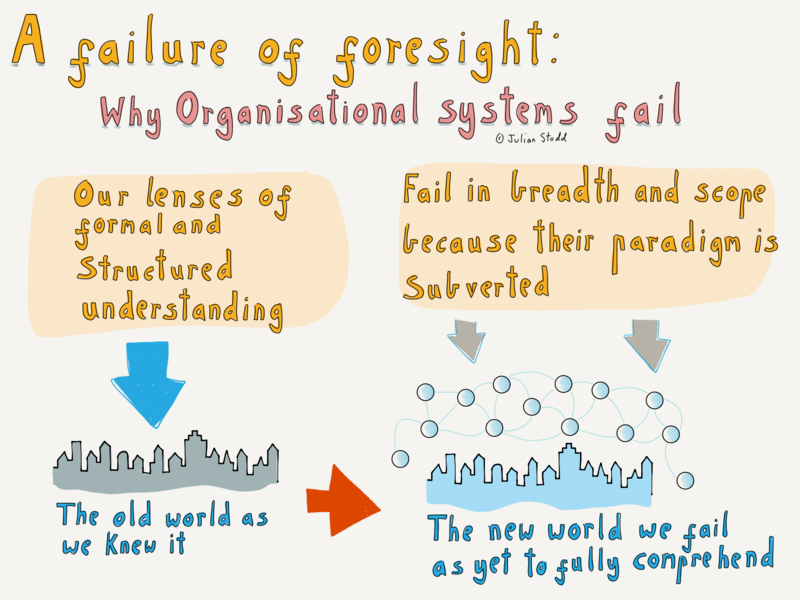 The way we view the world may be wrong: our greatest Organisations, structures of power and control, may be trapped in an outdated mindset, caught in redundant webs. Through our own failure of foresight, i believe that we sow the foundations of our failure. 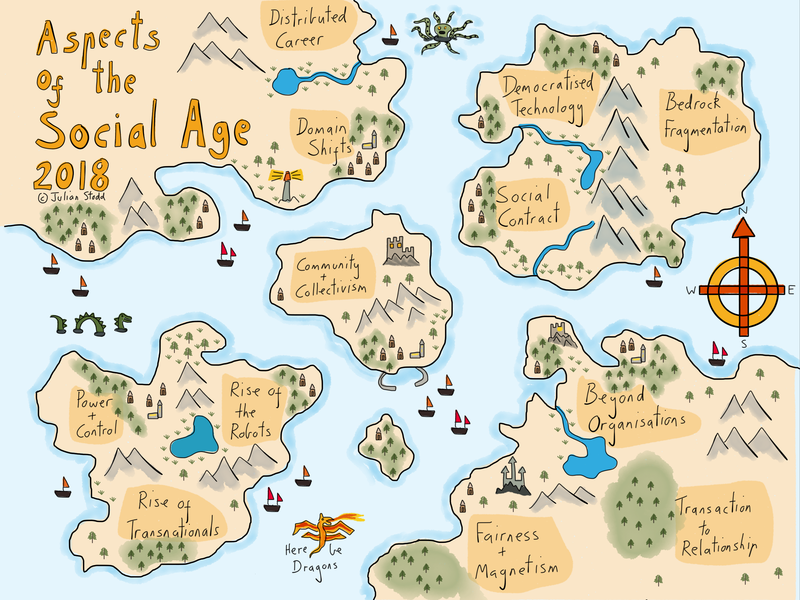 This post forms part of my 1% work: future facing effort to understand the full context of the Social Age, and to define the new principles of organisational design, individual behaviour, and systemic change that we need, to adapt to it. It also means that much of it may be wrong, but in an effort to figure out what is right. At this stage, much of our effort should be to review our lenses: the ways that we look at the world, the paradigm we exist within (or falsely believe that we exist within). In my work on ‘Black Swans and the Limits of Formal Hierarchy’, as well as that on ‘Innovation and Disruption’, the notion of ‘Category Errors’ is valuable: instances when we believe that we perceive structure and understanding, but are deluded in that, and crucially, we are deluded into structures that we ever more vigorously believe are right, but which are almost certainly wrong. We only ultimately see the light of day when the frame collapses, when stark reality fractures the illusion. I suspect that much of our action today, many of the ways we govern, organise, trade, and live, fall into that space. I suspect that the subversion of old norms by new modes of social organisation, collaboration, and new types of power, break almost everything. The lenses through which we view the world are largely learned: culturally conditioned, comforting, and delusional. Wilful, useful fictions, but delusions nonetheless. We see the world through our understanding of ‘how things usually are’, ‘how things should be’, and ‘how things normally are’. We base our projections about the future state, largely in our understanding of the current, or legacy, state. As i say, this is useful, because much of the future state typically IS framed by the current, or past: ‘self driving cars’ are still ‘cars’, so the frame still holds. But what if self driving cars own themselves, or what if coffee shops become cars (cars that serve coffee, provide wifi, let you have hot dates, etc), just how far can ‘experience’ intrude into ‘transport’, before it becomes the thing itself? There is innovation within a known frame (make cars faster, more comfortable, varied, but similar), or innovation outside of, or even in opposition to, the known frame (make cars mobile houses, or let cars choose passengers). 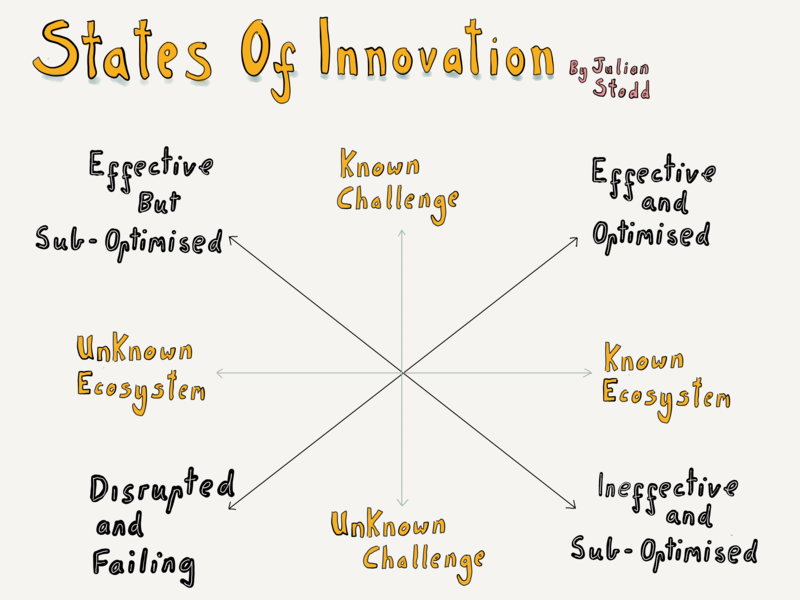 There is known risk, and known reward, which can be chased through known plans, and known frames of innovation. And then there is the unknown, or even, some would say, the unknowable. It’s the intrusion of the ‘unknowable’ into the known space that often subverts us. But when we see innovation, and when we see change, the vital thing to remember is that the change is not just external. As the trappings of society evolve, so too does the paradigm of society itself, and if our lenses are a construct of the old world, they become outdated. I think that we are firmly in this space. In the old world, ‘work’ was where we worked. Today, we work anywhere. ‘Work’ was a place, but now it is an idea. ‘Work’ was paid, but now pay, and reward, may flow in abstract and convoluted ways (crowd funding, reputation economy, blockchain). In the old world, ‘power’ was substantially held in hierarchy, but today, ‘power’ is held in communities, in codified reputation, in shared stories. In the old world, structural power typically quashed social, but in the new world, social authority, carried with great authenticity, can trump, or subvert, the formal, in almost every way. In the old world, the dominant modes of social organisation were ‘nation’, ‘Organisation’, and ‘religion’, but today, we build on those with ‘community’, the new ‘guilds’, and emergent ‘conversations’, strange social movements of #MeToo, #TakeAKnee, #NeverAgain, socially moderated, rapidly evolving, and beyond individual or organisational ownership and control. Our cognitive development is substantially based on learning ‘how things are’, and ‘how to learn new things’, but the two do not operate in isolation: the things we know will colour and direct the things that we are willing, or unwilling to learn. And there is a second degree of constraint: the things that we do, the structures that we nest within, give us power, reinforce and define identity, and codify safety, so we cling to them with great energy. All of this does two things: it prevents us seeing how we should change, and it prevents us changing. Our paradigm is already subverted, and we know it. Nations are challenged by emergent and fluid subscription cultures, and encumbered by legacy infrastructures from a bygone industrial model. Road and rail networks do not facilitate the drone economy, banks to do facilitate blockchain, established media do not facilitate co-creation, and formal power does not reward needed subversion. The Organisations that we inhabit today, in both structure, and purpose, are outdated. 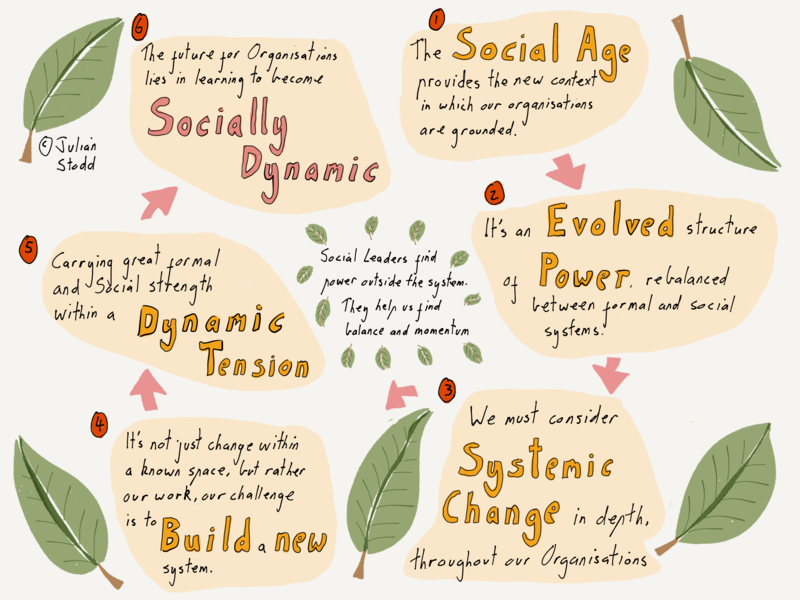 We must identify, and build, the new principles of Organisational Design, of fair Engagement, and Social Leadership, that will let us adapt to the new world. We must learn to find a diversified strength, a strength that lies beyond domains and codified strength, and draws instead on interconnected individual agency, amplified and socially filtered knowledge, and lived, tribal, learning. If we attempt to hang onto an old paradigm, we will be actively inhibited from seeing the truth. Our challenge is not to discover, or buy, the new models. Our challenge is to invent them. It’s not hard to envisage the future. Sure, we may not yet understand how robots will impact it, but impact it they will. We may not yet know how machine learning will subvert learning, but subvert it it will. Within our known ways of viewing the world, we can conceive of difference. But conceiving it is different than foresight. And both robots, and AI, may be a distraction from the real thing. The old world that we knew was not simply an aggregation of artefacts: it was more than just laptops, school books, presidents, and paracetamol. It was a construct based upon all of these, but ultimately it was a shared dream, a social construct. So much of what we are is socially moderated, and shared. Language is not innate: it’s learned. Sure, there may be an instinct for language, but two children who grow up in isolation will invent their own. They will not learn english. The ways we use our knives and and forks, the side of the road that we drive upon, algebra, and recipes for pancakes, are all socially constructed and learnt. It’s not about the metal of the knife, or the egg in the pancake. It’s the social construct that we live within. New technologies are the most visible manifestation of change, but they are just one aspect of it. It’s what they change that counts, and it’s this context that we miss as our lenses are wrong. When we look at the world as simply an interconnected set of artefacts, we miss the vision of the world that we live in, or the world that we are moving into. The change we experience will substantially be social: society will evolve, through technology, but at heart, through an evolved sociology, and even group psychology. Who we are may not change, but how we are will. Parts of our understanding, and mastery, of the old world will help us envisage, and build the new. And parts of our understanding of the old world will inhibit and blind us to it. We are not there yet. One reason that we cannot see the new world, the dynasty of the Social Age, in all of it’s broad context, is that we are not there yet. We have cast off, thrown off the ropes and bindings of the past, but we have not yet made the voyage. We are at a time of disruption, a time of change. We have glimpses of the new, but there is no one, systemic, version of it. There are multiple, rapidly prototyping, glimpses of what may be to come. But it is not here yet. The change we face will be a phasing system, not a static one. We are leaving stasis behind. The old world we could master through rules and system, but the new one will be more fluid, dare i say ever changing. Our old strength, to master the legacy world, was codified, but our new strength, to thrive in the new, will be both diversified, and constantly fluid. Ever in motion. We will need a new capability in sense making, to determine what has changed, and a new form of strength to exist in the new space. Structurally, some things are clear: whilst the old word was characterised, and largely governed, through formal power, the new one will not be, despite the thrashing we see today of legacy systems that try to hold onto the old. Formal systems will certainly exist, but they will be held in a Dynamic Tension with social ones. The frame may be static, but the truth will be a fluid entity, determined in snapshots according to context. Old strength will not carry us into this new space, indeed, old strength will actively prevent us from finding it. The thing we need already exists, partly within the system, and partly within ourselves. We need to nurture, build, and listen to, the diversified strength, the unheard wisdom, of our broader community, even when that comes into opposition with the formal system. We need to find the humility to listen, and change, even when it takes something away from us, in the knowledge that what it gives us will be more, will make us stronger. We are, ultimately, moving away from a single point of power, to a distributed one, across many contexts. Increasingly our personal ability to thrive will be held less in that structural power, the power granted us within a system, as much as it will be in our ability to reach out, to listen, to constantly evolve, to humbly step aside, and to change, and facilitate change with others. The failure of foresight is the precursor to failure. The thing we are looking for at this stage is not a definitive answer, but rather a held capability to determine possible answers, and a community and context that allows us to prototype them. We are looking for an ability to set aside our ‘known knowns’, and be open to new ones. The lenses that we view the world through must be adapted. We must question everything, and build the sense making structures and entities to enable us to do so. We must learn how to change. Part of comprehending the new paradigm is to relax our gaze upon the current one. For as long as we attempt to comprehend, and frame, disruption within a known lens and context, we will fail to find the new one. 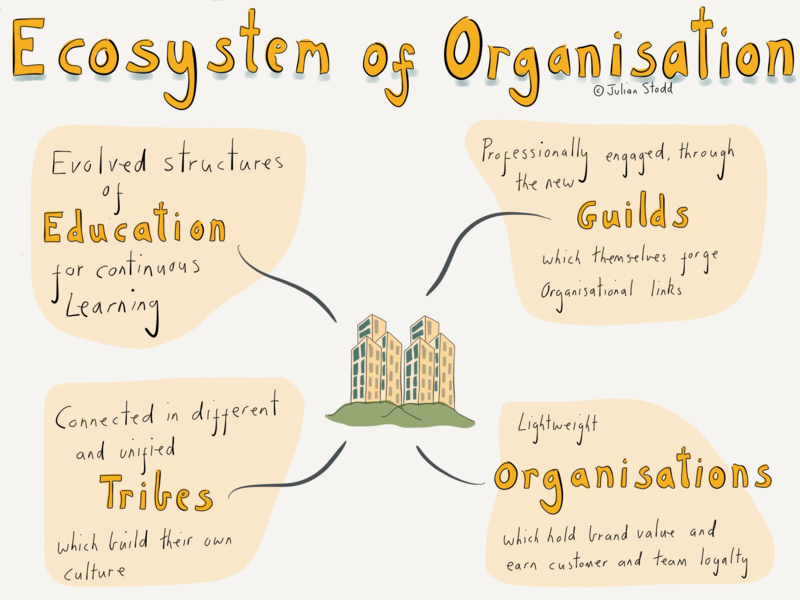 The very structures of todays Organisation that allow it to thrive in an old world, may well be the very structures that prevent it finding, and exploiting, the factors that will enable the new. The answers lie within, but without foresight, we are destined to fail. 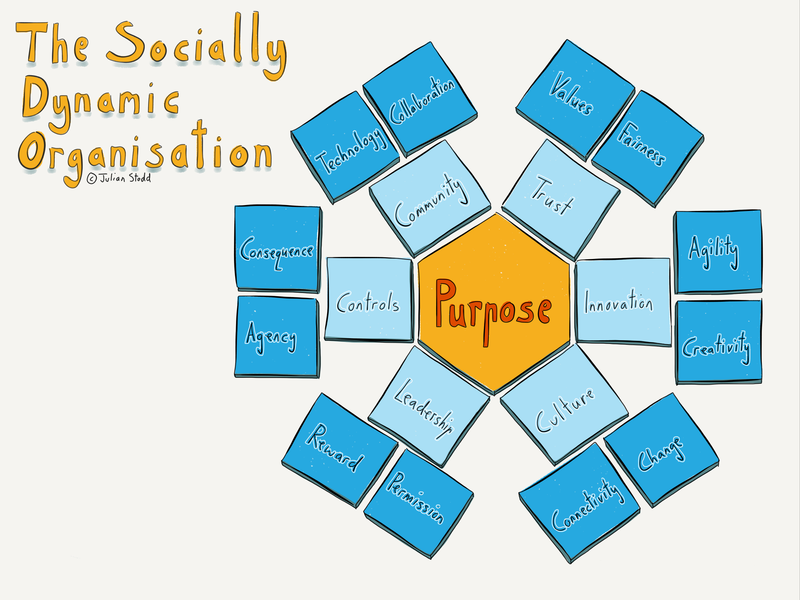 This entry was posted in Change and tagged Change, Failure, Hierarchy, Leadership, Organisations, Social Age. Bookmark the permalink.